Obama Ready to Go Big on Budget Deal? ….Rather than roughly $2 trillion in savings, the White House is now seeking a plan that would slash more than $4 trillion from annual budget deficits over the next decade, stabilize borrowing, and defuse the biggest budgetary time bombs that are set to explode as the cost of health care rises and the nation’s population ages. Unlike a lot of liberals, I’m open to deals on Medicare and Social Security. Obviously the details matter, but means testing of Medicare has always been a reasonable policy option, while small changes to Social Security’s inflation calculations have a lot of support from both liberal and conservative analysts. This isn’t necessarily a disaster. I think it’s now finally time to stop pretending that Obama has miscalculated, or blundered, or been out-negotiated, or somehow forced into a bad position. Rather, everything he’s done for at least the past six months is consistent with the idea that he considers the long-term deficit a problem, he wants to address it, and he views the debt ceiling talks as an ideal opportunity to do so with bipartisan cover. Obama isn’t doing this because he has to. He’s doing it because he wants to. Jon Chait argues that Obama would be a fool to allow the Bush tax cuts to be part of this deal. Instead, “If Obama wins election, he needs the ability to use the GOP’s opposition to any middle class tax cut extension without an extension for the rich as leverage to let Republicans kill the whole thing for him.” But this assumes that Obama secretly wants to kill the whole thing. I don’t think he does. He’s said all along that he wants to let the high-end tax cuts expire but keep the middle-class cuts, and it’s time to take him at his word. That’s what he wants to do. Answer: yes I do. This isn’t what I want, and it’s not what the progressive wing of the party wants. But the plain fact is that deficit cutting is pretty popular across the board, modest reductions in Social Security and Medicare will probably go over fine with independents, and anyway, liberals have nowhere else to go. A few might actually do what my friend threatens to do, but in the end it won’t be many — especially after the Republican Party settles on a candidate and we’ve all had a year or so to get to hate him (or her). And Obama will raise a fantastic amount of money from wealthy donors who are OK with this kind of dealmaking regardless of whether the progressive blogosphere is happy with him. Like it or not, the sad fact is that Obama doesn’t need us. We’re mostly going to vote for him regardless of what he does, and he’s going to get all the money and organization he needs without us. Lefties simply don’t have much leverage these days. So not only can the Democratic Party survive if Obama does this, it will probably flourish, electorally speaking. That’s not a happy conclusion, but I think it’s likely an accurate one. But needless to say (again), details matter. 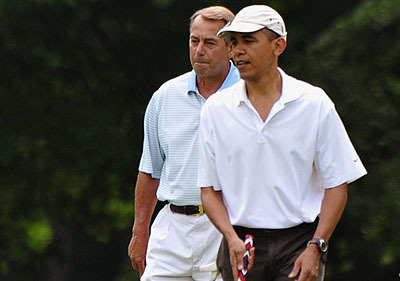 So before we get too hot under the collar in either direction, let’s wait and see what kind of deal Obama and Boehner really make.